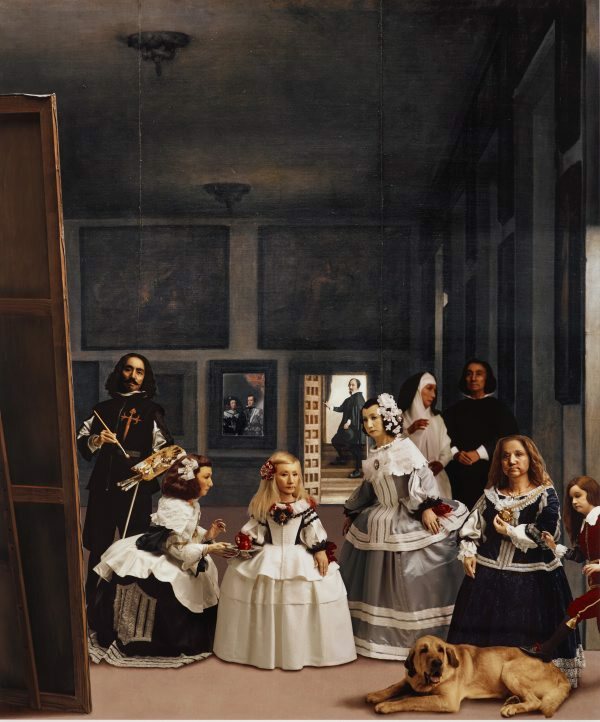 In this meditation on Diego Velázquez and the 17th century Spanish artist’s compelling painting at the Prado, Madrid, Morimura has reworked the 1656 painting 'Las meninas', enhancing the mysteries and creating a possible narrative of appearance and disappearance. Morimura is also intrigued by the painter’s interest in those outside the mainstream of society as much as those who patronised him. Morimura was allowed to photograph at night in the Prado and, as is usual in his work, he plays every figure. What is unusual is that this is the first time Morimura has used an actual location rather than remaking it. The work plays on the notion that objects in a museum may come alive after the visitors have left. 'Las meninas' 1656 is one of the most analysed paintings in the history of art. Who is looking at who and who is a reflection or representation remains tantalisingly unresolved. It is a painting that Morimura long considered a work he wished to ‘inhabit’ because of its status and complexity. 'In praise of Velazquez: distinguished ones in confinement' shows each figure as played by Morimura gazing out beyond the frame.